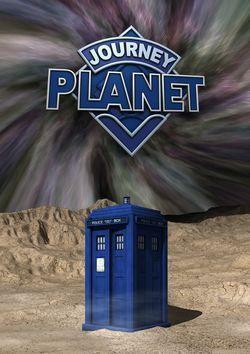 Journey Planet #19 is a 100-page homage to Doctor Who. Guest editors are Colin Harris and Alissa McKersie.The cover is by 2000 AD writer Michael Carroll who also provides an article. Other contributors include Al Reynolds, Mark Oshiro, Eoin Colfer, Linda Wenzleburger, Erin Underwood, Jesi Pershing, Lance Parkin, Simon Clark, Esther MacCallum-Stewart and Paul McCauley. This entry was posted in Fanzines and tagged Journey Planet by Mike Glyer. Bookmark the permalink.